These eight artists, curators, critics and art historians will award half of the $500,000 in prizes at ArtPrize Eight this fall, including the $200,000 Juried Grand Prize. GRAND RAPIDS, Michigan, April 28, 2016 -- ArtPrize, the radically open international art competition decided equally by public vote and expert jury, today announced the 2016 panel of jurors that will award the $200,000 Juried Grand Prize and $62,500 in Category Awards at the eighth iteration of ArtPrize, slated to take place in Grand Rapids, Michigan from September 21-October 9. The $200,000 Juried Grand Prize will be awarded by the a panel of three jurors, including: Michelle Grabner, artist and professor at School of the Art Institute of Chicago; Paul Ha, Director at MIT List Visual Arts Center; and Eric Shiner, Director at The Andy Warhol Museum. Five $12,500 Category Awards -- four awarded to artists for outstanding work within their respective categories (2-D, 3-D, Time-Based and Installation) as well as one awarded to a venue for outstanding curatorial presentation -- will be selected by: Tina Rivers Ryan, New York-based art historian and critic (2-D); Omar Lopez-Chahoud, Artistic Director and Curator of UNTITLED Art Fair, Miami Beach and San Francisco (3-D); Yesomi Umolu, writer and Exhibitions Curator at the Reva and David Logan Center for the Arts at the University of Chicago (Time-Based); Deana Haggag, Director of The Contemporary in Baltimore (Installation); and Steve Dietz, Founder, President, and Artistic Director of Northern Lights.mn in Minneapolis (Outstanding Venue). Following the addition of juried awards in 2010, ArtPrize introduced its parallel awards structure in 2014 -- splitting the $500,000 in cash prizes equally among the public vote and jury of art experts. During the first weekend of the 2016 competition, September 24-25, the Category Jurors will assess the entries within their respective categories, each selecting a shortlist of five entries. The 20 finalists will then move on to the Grand Prize jurors’ selection. On Monday, September 26, the Category Jurors will reveal their finalists during the “Jurors’ Shortlist” event, broadcast live on NBC affiliate, WOOD TV8. Category and Grand Prize winners will be announced at the ArtPrize Awards on October 7 at 9:00 p.m. EST. Artist registration for ArtPrize Eight is now open. Anyone over 18, working in any medium, from any place on earth can enter to participate in what The Art Newspaper has named for the second year in a row, the world’s largest art competition. Over the last seven years, nearly 11,000 artists from around the world have filled every corner of downtown Grand Rapids, Michigan with their work. Applications for Artist Seed Grants, presented by the Frey Foundation, are now open for a third consecutive year. ArtPrize will offer 25 artists $2,000 grants each to realize their ambitious art projects at the event this fall. Interested artists must demonstrate both financial need and artistic merit, and submit their applications by the close of Artist Registration on June 2 at 5:00 p.m. EST. Applications will be reviewed -- and the grantees selected -- by the ArtPrize Arts Advisory Council, a panel of art critics and experts. Venue registration for the eighth annual event closed on April 7. 183 venues -- from museums and public parks to restaurants and coffee shops, and including 38 new spaces -- seek to participate in the eighth annual event. Unlike any other art event of its size, ArtPrize plays no role in selecting the artists who participate -- each venue is independently organized. Registered artists and venues will find each other and connect online at artprize.org during the Connections period, now open through June 16, agreeing to present the artwork for public display during the 19-day event this fall. Tonight at the highly-anticipated 2016 Premiere Event, ArtPrize -- in partnership with Grand Rapids-based design firm Conduit Studio -- also revealed the design concept for the eighth annual event in front of a capacity crowd. ArtPrize and the Conduit Studio team were inspired by the creative tension that exists within the fabric of the event -- between art and viewer, artist and venue, public and juried vote. Exploring this tension led to a design that departs from the traditional event poster aesthetic -- a system of 52 interchangeable patterns, with each individual combination creating a signature “8” to capture visitors’ unique and varied experiences. ArtPrize occupies three-square miles of public and private venues across downtown Grand Rapids, Michigan. Visit artprize.org/venues for more information. 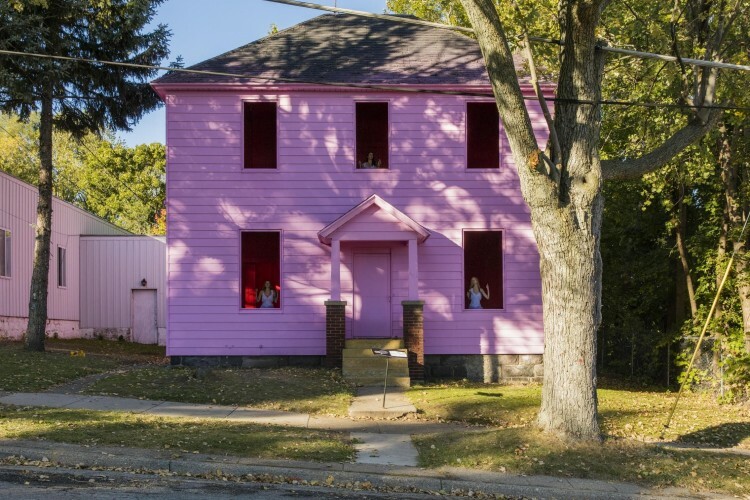 Photo: "Higher Ground" by Kate Gilmore, winner of the ArtPrize Seven Juried Grand Prize. Credit: Filippo Tagliati.